Classes represent the main character's role in the party. Each class can be leveled up to 20, earning active skills and passive bonuses along the way. Upon reaching level 20, the class will earn a Mastery Bonus, which is a permanent, passive stat boost that applies to the main character regardless of the current class. Additional levels gained beyond level 20 will instead generate 1 Extended Mastery Point (EMP). Classes are divided into 5 categories, Row I-IV and Extra. 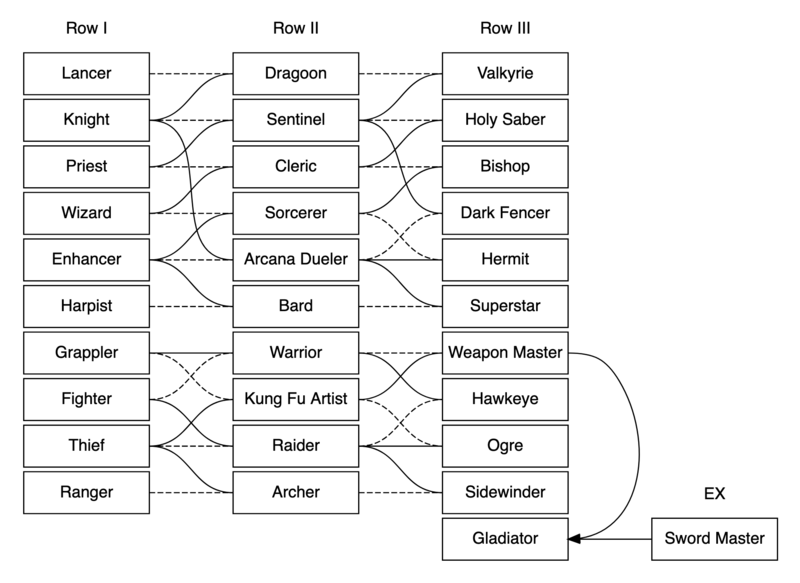 Each of the Row I classes has counterparts with similar roles and skills in the other Rows with more powerful and versatile skillsets, forming lines of classes that share certain features such as sharing Extended Mastery Skills and Class weapons. Unlocking Row IV classes requires 2500 CP, 20 corresponding Class Distinctions, and having completed a special class quest. The quest is unlocked by crafting any Class Champion Weapon in its entirety. Unlocking Extra classes requires CP, Warrior Creeds or Mage Creeds or Champion Merits, and a trophy from having hosted and completed various Extra Coop Quests or Free Quests. , and a trophy from having hosted and completed the respective Free Quests.